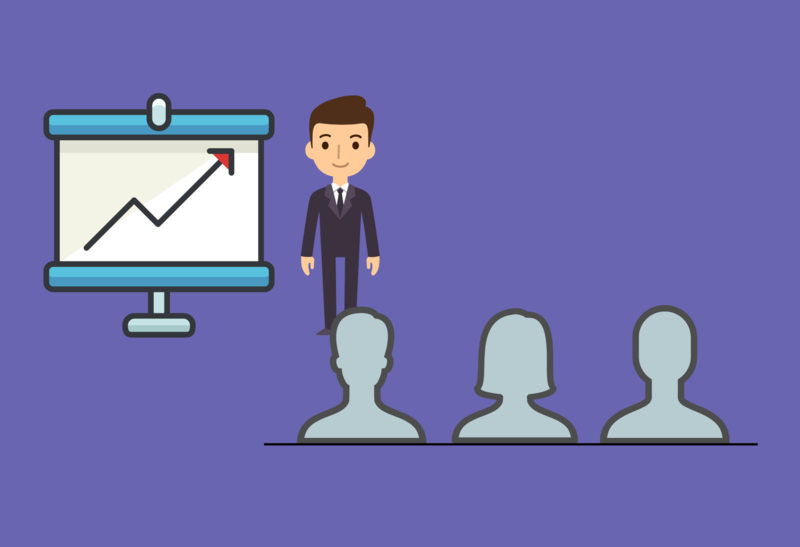 In this post we’ll be helping you understand how to do a good sales presentation. Let’s face it, we all need to know how to do a good sales presentation. Even if we’ve been “in the game” for a long time, selling the same products — our presentations can get stale after awhile. Sure, you may be so comfortable with your go-to presentation that you don’t feel much incentive to change it, but that’s a sign in itself that it’s time for a revamp. The moment you get too comfortable with anything in the sales world, something is amiss, right? Nothing induces a snooze fest faster than stale, old and irrelevant presentations. Learning how to do a good sales presentation is the key to your success in sales. Your goal is to be persuasive, unique and keep your clients awake and interested. 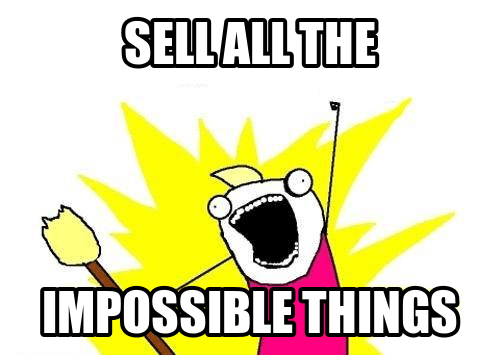 That’s the crux of how sales presentations work, right? Sounds simple, but it’s not always so cut and dry. Depending on your personality, the presentation process either leaves you excited or biting your nails in anticipation. No matter your personal feelings toward them, presentations are at the heart of what you do and they aren’t leaving the picture any time soon. Having a presentation that’s unique and that you feel proud of will give you that extra boost of confidence you need to close the deal. Confidence is contagious; if you have it, your potential clients will feel it and become more confident in your company and brand. If you are feeling a bit stuck for ideas, here are 5 tips to help you knock your next sales presentation out of the park. This is the most basic tip we will cover today, but it’s extremely important and often overlooked. Remember why you are there—there is a problem or challenge that your company can help solve. Niching down and understanding a target industry or prospect really helps here. The moment you lose sight of this important detail, you have killed your own presentation. No one wants to hear about what you offer when it doesn’t relate to them. Focus on the particular parts of their business that you will make easier/more effective etc. with your products and services, not just about your company. Many salespeople fumble at this stage by having a cookie cutter presentation that lacks focus on the exact needs of the company they are presenting to. It’s boring and irrelevant. 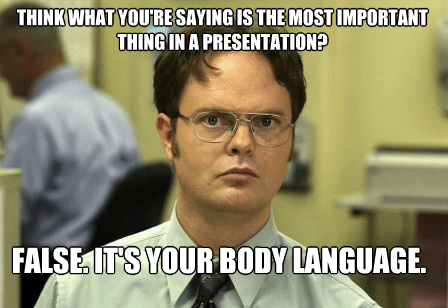 There are many factors you can’t control during your presentation…the obnoxiously contagious-sounding cough of the guy closest to you, the heavy breathing of the executive to your right…fortunately one of the most effective factors is something that you can control—body language. Our body language says more than our vocal chords each and every day. Jennifer Burnham over at Salesforce has several great tips for mastering your body language during presentations. Lean Forward – It’s not hard to gauge interest in a conversation. Think about a great date or a great conversation with a friend you’ve had recently. You were engaged in an animated conversation and probably nodded and leaned forward excitedly, right? It comes naturally when you are with those you are comfortable with, but you will likely have to be a bit more conscious of it during your presentations. If you’re slumped or not looking engaged, your audience will notice it. Keep Your Arms Open – Did you know that crossing your arms not only makes you look unapproachable, but it also makes you retain less information? In fact, you retain 38% less information with your legs and arms crossed! Never Point – Pointing is often viewed as aggressive and rude. If you need to gesture toward something, use a full sweep of the arm or basically anything softer than the finger point. Smile Naturally – You aren’t a robot, the people watching your presentation want to see an actual person with actual emotions. There is, of course, a difference between a forced smile and a natural one, but try your best to smile and act naturally throughout your presentation. Utilize Eye Contact – One of the easiest ways to keep any audience listening to you and engaging with you is by maintaining eye contact. It gives the appearance that you are speaking directly to them, this naturally awakens curiosity and attention span. Notice What Your Feet are Doing – This lesser-known body language secret could be giving you away; your feet may be showing your true feelings. Studies have found that our feet naturally point to those we prefer and away from those we don’t. When you consider the undeniable feeling we get to run away when we aren’t feeling connected, it makes sense. By comparison, if we are engaged in a conversation, we lean toward the person, and naturally face them. Additionally, feet placed close together is a sign of timidness while wide stance feet show more confidence. If your presentation is too well rehearsed, it will actually backfire. Many salespeople swear by memorizing each and every aspect of their presentation, but honestly if you sound like you are reading a memorized script, people will tune you out. If you were like most kids growing up in America, you probably had to memorize the Preamble for the Declaration of Independence. That awful type of memorization is mind-numbing. Make your presentations more fluid and open to going with the flow. If you’re simply spouting out a memorized speech, you’re bored and likely boring to listen to. This tip follows closely on the heels of addressing the company’s challenges that you will fix rather than focusing on what your company does. Essentially spend 80% of the time speaking to them about how you will solve a problem they are experiencing. Picture it like a first date. Is there anything that’s more of a turnoff than listening to your date ramble on and on about their accomplishments? 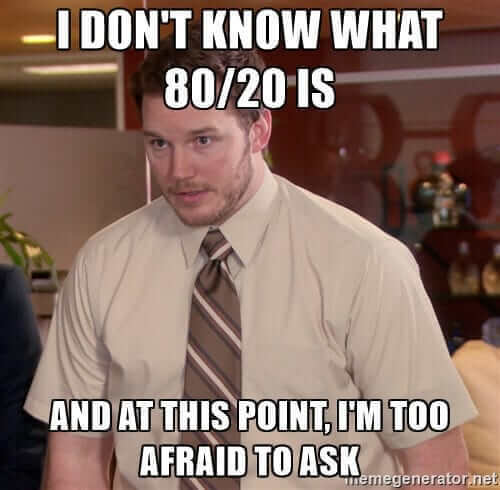 Their background and the 1000 things they’ve done since graduation? Don’t be that bad first date. You are essentially courting your clients, so be that gracious date that asks questions and focuses on the person on the other side of the table. Twenty percent you, 80% them. When in doubt, just remember you are there to solve a problem. Remember those seemingly endless days, trapped in school? Listening to your teacher drone on and on…? Chances are, you probably perked up a bit when there was at least some visual aspect or how-this-relates-to-you example. If your sales presentation consists of you talking and talking…and talking, you will lose the client’s interest. Case studies are a worthwhile tool not only for creating visual stimulation. They’re also good for showing real examples of how what you offer is utilized and why it was a success. They also serve as a way to cut through the confusion. No longer is it a list of 20 things you can do for them, but an actual outlined example of what you have done for others and why it worked. It’s another form of social selling really. We honor customer reviews above the words of a company, and when we utilize case studies, we are providing social proof that we are as good as our word. A great post by Steve Woodruff sums up the process of using case studies in sales presentations. Make sure your story is tailored to your audience. What good is your case study if it’s not relevant? No good at all, and worse yet it can only contribute to the customer’s confusion. Especially if it isn’t focused on a relevant topic. Focus on the client’s main need. There’re likely many problems you can help solve. But your goal is to focus in on just one. Cut through the clutter and use a case study that speaks exactly to the problem at hand. 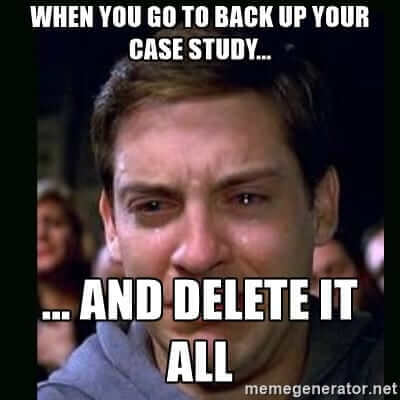 Use the case study to show specifically how you can ease their “pain points”. Every company has “pain points,” or specific areas of difficulty. Reinforce how you will make life easy with your customer success stories. Focus on results. The journey is great and all but when it comes to winning clients, it’s all about the results. Make sure you focus on these. Include a customer testimonial or quote. Social selling is where it’s at, when possible utilize the voice of your clients. Allow yourself plenty of time before your next sales presentation to utilize these changes. Once you do, you’ll likely feel much more confident in your presentation style. And your client retention rates will reflect this. You can check out a previous post we did if you’re looking for more sales presentation ideas. Ready to Crush Your Next Sales Presentation? Notice there is nothing on our list about knowing the product, or negotiating pricing, things like that. Because what your product does and how much it costs are trivial in comparison to the results the product achieves and how they feel about you and the brand. 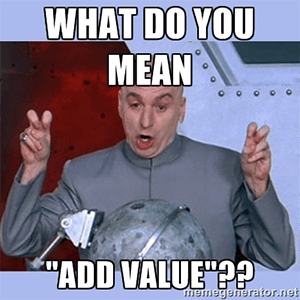 It may sound diabolical, but people (often times) don’t buy features or value. At least not nearly as much as results and emotion. Have you learned how to do a good sales presentation? What’s your go-to method when it comes to acing a sales presentation?